Xiaomi Redmi Note 5 Pro May Launch At Xiaomi's Event Tomorrow! 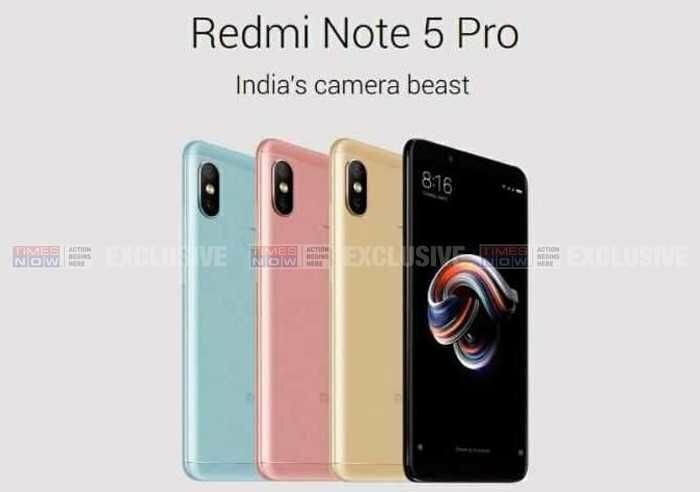 Amidst the possibility of the launch of the Redmi Note 5, there is now an added speculation of the Redmi Note 5 Pro making its debut at the launch event tomorrow. Hot on the heels of the rumours of the Redmi Note 5 launching on 14th January, now there comes one more piece of news of a second, unexpected smartphone that is going to launch with the Note 5 and Mi TV, the Redmi Note 5 Pro. This is a totally unexpected piece of news as the Note 5 Pro was nowhere on the radar before this. The Note 5 Pro is expected to carry a bigger screen and a beefier processor than the Redmi Note 5. But the talking point of the Note 5 Pro is going to be the iPhone X-like dual camera setup at the back. From the images floating around, it looks like Xiaomi has once again taken inspiration from Apple design. But the question remains. Is there really going to be a Redmi Note 5 Pro? Or is it just a part of baseless pre-release rumours? Let us try and find out. Xiaomi Redmi Note 5 Pro: Real Or Fantasy? Late last year, there were speculations that Xiaomi was killing off the note line in favour of the Redmi line of more affordable phones. But apparently, the Redmi Note 5 is launching on 14th February. And now so is the Redmi Note 5 Pro. Xiaomi has neither confirmed nor denied any of the speculations currently flying around. But if the Note 5 and the Note Pro are indeed launched during the event, India will be the first country in the world to get them, even ahead of Xiaomi’s home market, China. India is an important market for Xiaomi. A recent Cybermedia Research report has verified that Xiaomi was the no. 1 smartphone brand in India in the last quarter. Xiaomi has also launched Express One-Day Delivery Service in India along with an automated delivery service for added convenience. Xiaomi’s Redmi Note 4 has the best-selling smartphone in India ever. So, considering all these factors, it doesn’t seem too surprising that India could the first country in the world to receive the latest Xiaomi smartphones. Xiaomi has also committed to the ‘Make In India’ initiative by opening three manufacturing units right here in India. So yes, there is a possibility that we could see the Redmi Note 5 Pro launching at Xiaomi’s launch event tomorrow. The Note 5 Pro will possibly get a 5.99-inch Full HD+ 18:9 display with a resolution of 2160 x 1080 pixels. It will be protected by a 2.5D Gorilla Glass. It will have a dual-SIM hybrid slot and a 4,000 mAh or higher capacity battery. The dual camera setup will be made up of a 12-megapixel sensor with a f/2.2 aperture and 5-megapixel secondary sensor with a f/2.0 aperture. The selfie camera is said to be a 20-megapixel selfie lover’s dream. The smartphone will expectedly run the latest version of MIUI 9, which is still based on Nougat. Or is Xiaomi planning to surprise us with an Oreo build? It is worth keeping in mind that all these are alleged specifications and should be taken with a pinch of salt. It is also equally possible that Xiaomi does not launch the Note 5 Pro tomorrow. So that’s a 50-50 chance. But all our questions and speculations will be answered tomorrow as Xiaomi’s launch event progresses. Till then, let us take a moment to reflect on Xiaomi’s incredible journey in India so far. 21 Lakh Young Users Will Ditch Facebook In 2018; Facebook Is Illegally Using Data! note 5 pro that is something really good from xiaomi in the year 2018 with good features and design.